This complicated little map started with a simple request from Christian Klauser over on Patreon. The Lost Ossuary is a small dimensional rift beneath the Lobachevsky Church. Cut out of the stone beneath the church as a set of crypts and ossuaries, the Lost Ossuary displays bizarre geometries to those who would try to map it out. Routings through the Ossuary make little sense, with paths connecting with far less than 360 degrees of angle between them, and some secret passages connecting areas that should be hundreds of feet apart. To confuse matters more, the ossuary has two types of construction – rough hewn crypts and the carefully built ossuaries and tombs. Both areas are completely contiguous, and yet seem to cut each other up at times. In all, the structure is a nightmare for any who would try to map it out. This is of course because the planar topology of the Ossuary is a cube – however this is never apparent to those within it – the faces do not involve any changes in angles – the floors remain consistent and flat instead of switching by 90 degrees as one walks over the “angle” in the cube. 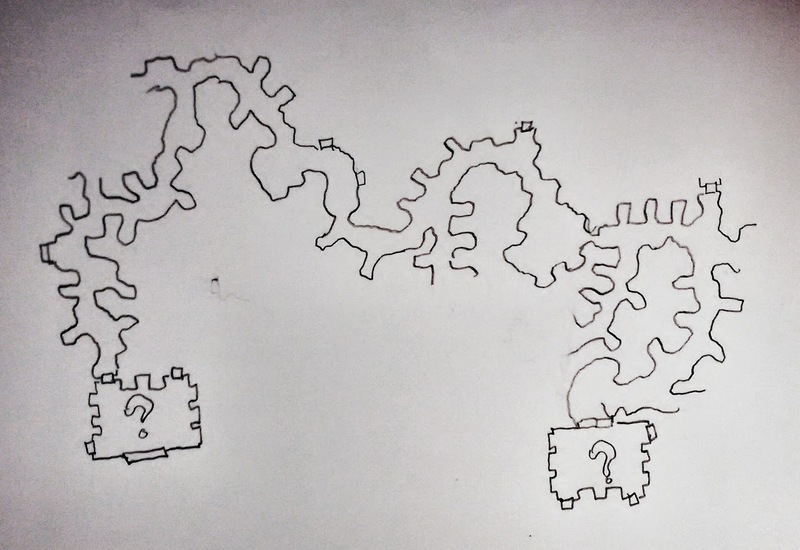 Exploring the cube will probably result in some weird maps… here’s a very simple map of just part of the crypts themselves that ends in the same room in two different locations, reached through two different doors. In time, any attempt to map the Ossuary from the inside will result in a map that crosses over itself and comes back from point A to point A with those two locations at wildly different parts of the map. 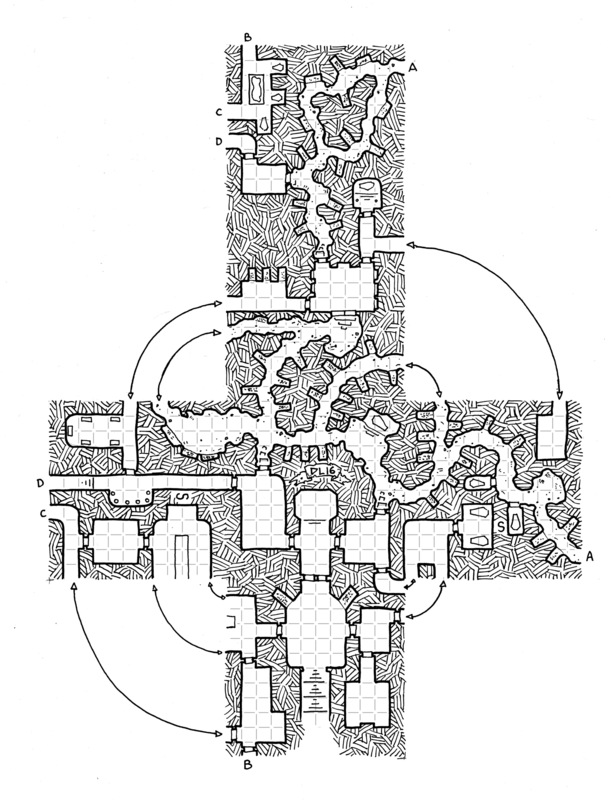 The Lost Ossuary works not only for classic fantasy gaming, but would be a perfect spot for a bit of adventure in a Call of Cthulhu campaign (non-Euclidean geometry), or for other games that deal in strange places and possible hyper-tech (Numenera, The Strange, or something happening just inside a rift in Rifts). Once the adventure is over, however, it might be fun to show the party exactly what was causing all the chaos. Here I’ve taken the map and made it into an actual cube to show how the halls and chambers connect. I printed it on some fairly heavy paper stock (it would be significantly easier to assemble using cardstock, mind you) and trimmed it so that there were tabs that I could use to assemble it. A bit of glue or tape and it goes from 2 dimensional to 3. As with all the maps on the Dodecahedron, this map is made possible by the amazing people who support the continued production of this fanciful cartography through my Patreon Campaign. Check it out to see how you can help keep the flow of cool maps coming for as little as 5 cents a map. Well, part of one: It’s lacking the ‘inside’, (accessed by going down from these levels), and ‘outside’, (accessed by going up from these levels), spaces. Absolutely correct. It would be fun to add in some trapdoors in floors and ceilings to really confuse things. Maybe that’s too complex, I’d hate to be lynched by my own players. That’s horrible. Now I want to make a bunch of regular polyhedra with dungeons on them. Maybe even a set of all five, call them the Tombs of Plathagoras, and build an adventure surrounding them and some sort of associate cult that worships math. This is the most awesome thing I’ve seen in a while, Dyson. You’ve again set a bar for mapmaking that few, if any, could equal. I am thinking that there is a secret trapdoor in the octagonal room below your logo with a spiral staircase that leads to the back of one of the crypts at the top of the map. That is beautiful . . . but it makes my head hurting trying to figure out how to explain mapping it to the players. You don’t ever mention the “bends” from one face to another. You just keep explaining how it goes, and after a while the players will realize the map doesn’t work. Even if you map it for them, do the same thing. Just keep drawing it as it happens, and after a while the map will make no sense and you will have achieved exactly what the map is meant to. Thumbs up for the map, and another thumb for the Bloody Basic:Mother Goose Edition! This is just pure awesome. Just the kind of thing a Lich or Vampire-mage would use as a lair. Why not another version with a library’s rooms for a enigma variation of the well famous book ” The name of the rose” ? An OSR tribute in memoriam of Mister Umberto Eco. With a complete monastery map, it will a a great piece of adventure to find a Lost Tome. This is pure awesome, thanks! I stumbled over this beautiful blog a few days and have been digesting maps ever since, but this one takes the price. Simple, funny, and mind-bending in the best way possible. 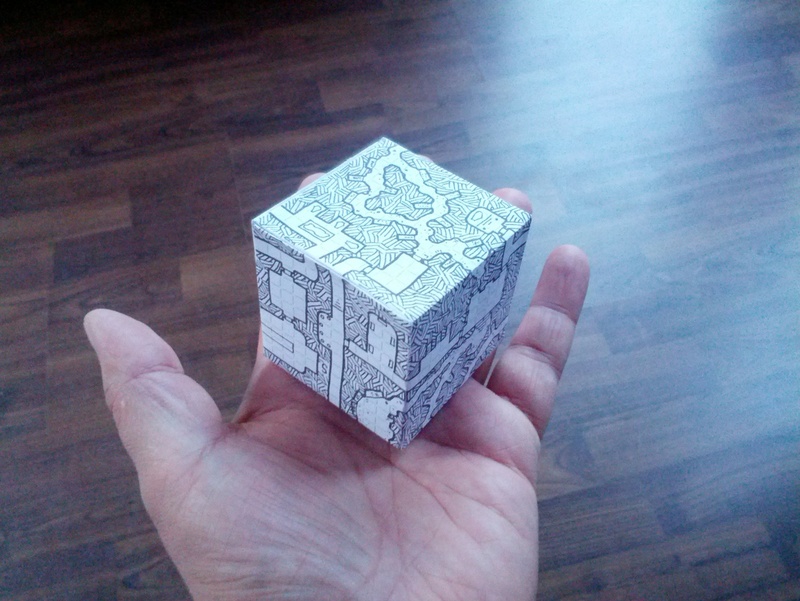 I immediately printed and glued the cube, now I’m waiting for the perfect opportunity to wreak havoc on my players (or at least the poor sod who’s mapping…). Beacues of this, I am going to make dungeon maps using all of the platonic solids as the topography of the dungeon, but I will make it impossible to walk down the same set of stairs forever without going back up any stairs like I can see in this picture. Which set of stairs allows you to go down endlessly. Sounds like a feature! There are some stairs to the left of marker “D”. If you travel through “D” to “A”, then using the secret door to the side of the coffin, you can then travel back to “D” without walking up and stairs. This means that you can travel down or up infinitely. Thanks. I see it now. Given the nature of the map, maybe the secret door involves some sort of additional spatial jump. When I drew it I figured the secret door was a very small space (about 30″ tall) that went from the floor of the tomb with the two coffins to the very top of the wall of the tomb with one coffin. The secret door doesn’t angle, it is just very awkward.